Today's entry in the Figures Cinema Forgot is a contribution of my buddy James Harris, who you may know as Doc Terror. Definitely some fantastic picks! 1. Stephen King’s The Mist – Can you imagine the inter-dimensional bug/animal hybrid mammoth creatures as a full sized, plastic renditions. Perhaps made of the same type of plastic molds that Battle Cat was made of in the old He-man line. Of course you could produce individual players as well. David Drayton, Mrs. Carmody… it’s really all just a set up to get the big monsters made, collectible and pose-able. 2. 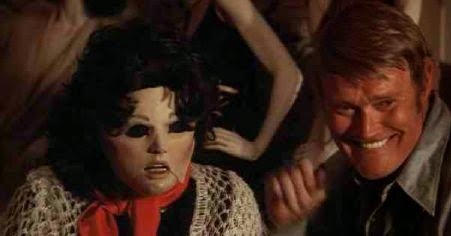 Tourist Trap – Davey and Mr. Slausen – Of course you can also make various characters that have detachable mannequin body parts but the main guy… the big one is Mr. Slausen/Davey. You’d need to make him two-faced (like Man-E-Faces from He-man) and you could also release separate figures. Slausen and Davey. You’d also have to have the mannequin creation lab where you would buy white ooze that you could drip on the “pretty” tourists into mannequins. 3. Creepshow 2 – Old Chief Woodenhead, The Hitchhiker and The Raft lake monster… I must own an Old Chief Woodenhead action figure. He should come with a hatchet, bow and arrow, paint can and knife as well as scalps (yes multiples). If we’ve gone that far then of course we should also create The Raft monster which is really just a large oil slick. This would be made of a thin nylon with multiple colors in it and filled with an oil like fluid. 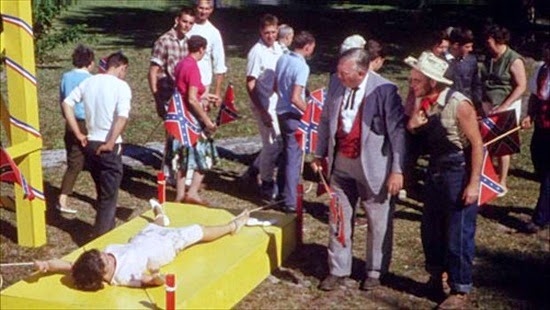 It would come with various skeletal parts as well… the raft. Perfect for the bathtub. 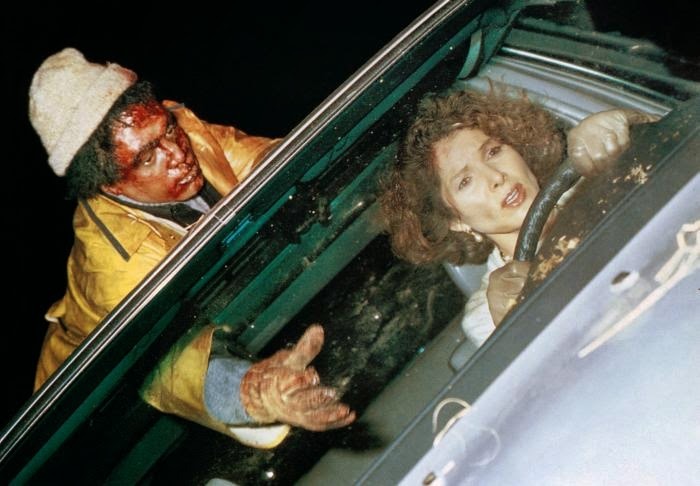 Then of course there’s the Hitchhiker. This one would have to have a push button on the back that says “Thanks for the ride, lady”. It would have multiple layers looking human and unscathed at first and then would peel back multiple layers to be completely mutilated including at least one tire tread, hanging eye ball and wearing a knit hat. Press the hat down and he squirts water. Die the water red for the complete effect. 4. 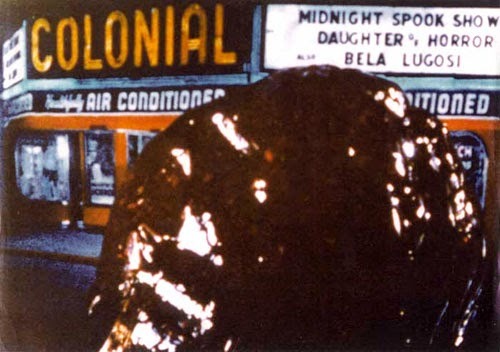 The Blob – This vexed me something fierce. No Blob toys? Really? How have we gone over fifty years without an appropriate Blob toy? This is how it would work. You get a pink gel fluid that is exactly like the green slime from your favorite 80’s toys. The thing is, what good is a Blob unless you have things for the Blob to seep through. Enter the play dough set you had when you were a kid. The one that squeezed out the dough into long strips when you pressed on the handle. This would extrude the pink goo through whatever you’d want. It would come with a theater set, a small container (ala Son of Blob) and option bowling alley or ice rink play set. You can buy add ons from all three movies (include the remake). Perhaps a darker, more sinister variant for the 1988 Blob with gory victims. 5. 2000 Maniacs Toys – for this toy you’d need several separate figures. Each toy would mimic one of the gory death sequences form the picture. You’d get a character that in a barrel with nails outside of the barrel, you’d roll it, the nails would go in and the head would pop out the end on an elongated bloody neck. You would also have a crusher toys that dropped a giant weight onto one of the characters. Another action figure would have removable body parts to be hacked off. Of course each set would come with a southern flag banner with Pleasant Valley written across it in turn of the century type face to spread out in your living room while you play. 6. The Gate – First you’d have a Glen figure. He would come with several rockets including a giant rocket and would have an eye in the palm of his hand. The deluxe Glen would include the family dog. Then you’d have Terry in full heavy metal uniform. He would come with a small record with exquisite details, but he would also come with a small, thin vinyl (think of the one’s you’d get in cereal boxes in the 80’s). It would feature the back masked instructions to raise and dispel the demons (Sacrifyx artwork). Each figure would come with a couple minion demons. You could be separately the giant lord demon. He would come with variations of the smaller demons. Limited edition send away dead construction worker with proof of purchase. 7. Prince of Darkness – Yes you could buy an Alice Cooper action figure, but you could also buy a Donald Pleasance one as well. Pleasance would come with the green good jar. Each character would come with a holographic mirror. You could have Dr. Paul Leahy, Calder and of course the big bad, face peeler at the end. This set could actually creep me out no matter how basic. I’d be staring into the holographic mirrors the whole time waiting… for something. 8. 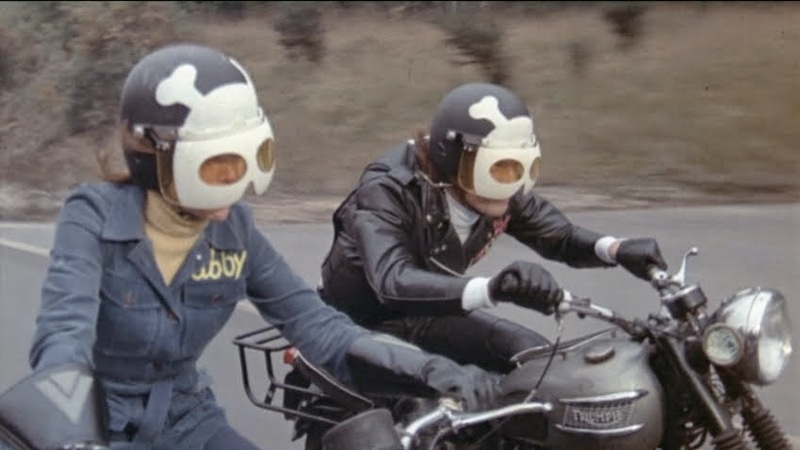 Psychomania – Think of this as an old Evil Knievel play set with a skull helmeted biker being launched through several different obstacle. The set would come with a frog toy and various versions of a brick wall. Pull the bike back a few times and watch it thrust through the wall. 9. BBK – The reason this needs to get made is pure and simple. 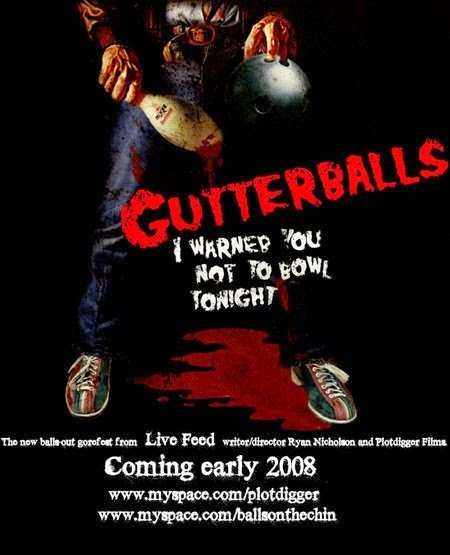 Gutterballs is a totally raunchy, cult slasher neo-classic with lots of fans who would love to play with the BBK and more than just as a pillow buddy. You could give him his “helmet”, bowling pins (several and one sharpened), bowling shoes, two bowling balls, but I think the real sell here is to use the variations of cover art to give him different holographic faces underneath his bag head. 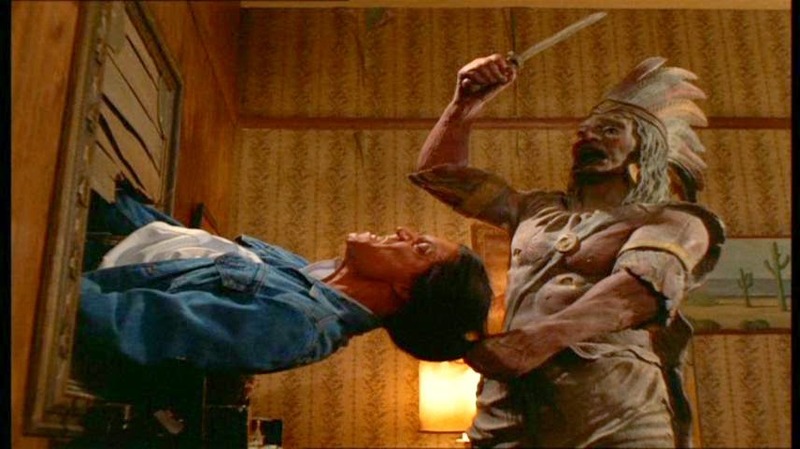 You pull of the head and then you could see him as Joe Spinelli from Maniac or Camille Keaton from I Spit on Your Grave etc. Each one would be different having a different holographic face under the mask. Collect them all. This one would come with a bowling score card with BBK on it. Comes with a small ball return and severed head. Thanks to James Harris aka Doc Terror for his contribution. Be sure to stop by his site for constant reviews, updates and giveaways! And don't forget to follow him on Twitter and like him on Facebook!